Yes, you read that correctly. At first what I thought was an isolated incident, it now appears that others are also experiencing the same problem. Just what am I talking about? Well, updating Community Sources in Installer caused my iPhone 3G to freeze and end up in a continuous Apple logo reboot loop. My original intention was to get my hands on Installer Beta v4.0b9. So once I launched Installer I saw the update icon for Community Sources. I proceeded with the update, and after it finished downloading and installed itself the iPhone immediately rebooted. This is when the nightmare began. Normally an iPhone reboot does not take that long. So when I thought that my phone was just taking a bit longer than usual to update, I got very suspicious. The phone was frozen on the Apple reboot logo and after trying a hard reset (hold down both Home/Sleep buttons simultaneously) a few times, nothing worked. The phone just kept on rebooting into an endless loop! It just so happened that I was on my way to the movies when this happened so I had no access to a computer (and the internet) to figure out how to fix this problem. So after 3 hours of excruciating pain I soon realized just how naked I felt without my iPhone 3G and my data plan at my side! So I get home and think to myself that a simple restore in iTunes will solve the problem, right? I proceeded to connect my iPhone 3G to both my MacBook and PC–but iTunes (version 8) did not recognize my iPhone! At this point in time I’m wondering if this iPhone actually got “bricked” due to my jailbreak. – hold down the Home button on the iPhone while plugging the USB cable into your computer. iTunes will show a message that this device needs to be restored. The unfortunate thing is that I lost some pictures I had on my iPhone 3G, but luckily my old PC notebook still had a recent backup that I was able to sync and restore to. After an hour or so of troubleshooting I had my iPhone 3G back up and running. 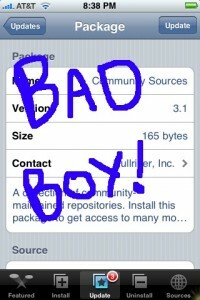 I lost my jailbreak but at the same time I was amazed at how responsive a factory-restored iPhone was! So there you have it folks, this is my warning to you jailbroken iPhone users out there: be careful when updating Community Sources via Installer or you might have to end up restoring your iPhone like I did! You’ve been warned! Anyone else out there end up with this problem too? Let me us know! 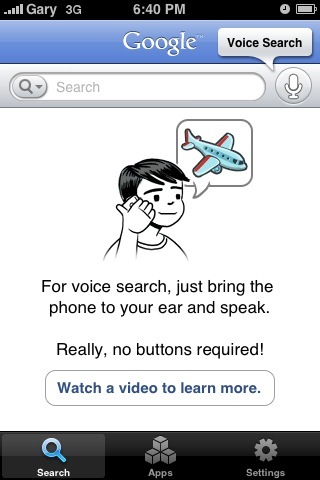 Google iPhone Voice Recognition Application = Best App EVER!